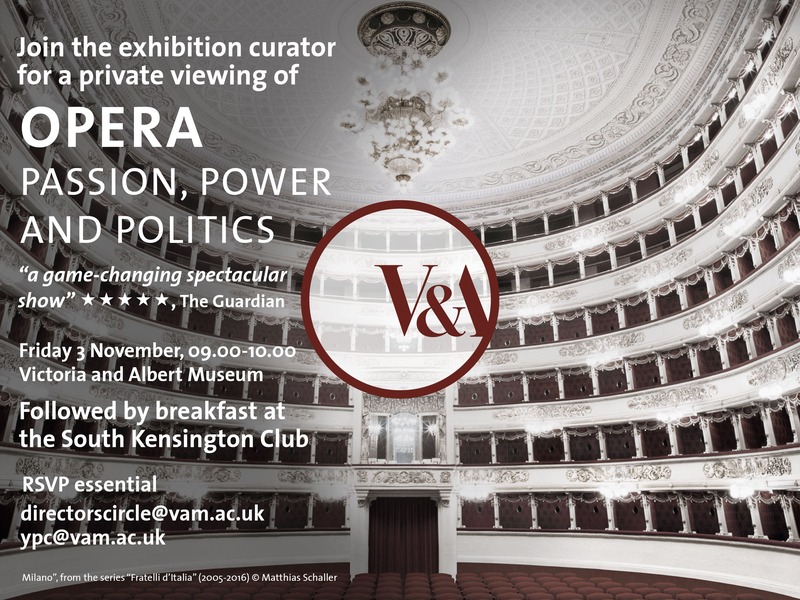 “The V&A and Young Patrons’ Circle Co-Chair Faaiza Lalji (GSD'13) invite you to a private viewing of the acclaimed exhibition Opera: Passion, Power and Politics with an introduction by curator Kate Bailey. After the private viewing at the V&A from 09:00am – 10:00am, we will have breakfast at the South Kensington Club, just a short walk from the V&A. Places are limited to keep the event as special as possible so please RSVP to directorscircle@vam.ac.uk or ypc@vam.ac.uk to reserve a place. The morning is organised by the Young Patrons’ Circle and Director’s Circle and is a chance to find out more about getting involved in the Museum.